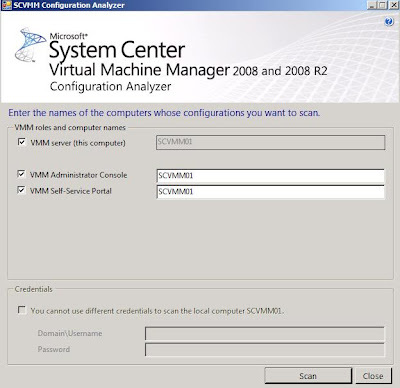 I'm recommending that you download and run System Center Virtual Machine Manager 2008 and 2008 R2 Configuration Analyzer before you install SCVMM Server, VMM Administrator Console and VMM Self Service Portal . The system will come out with a pop up error message if you did not install MBCA. Run the tools and enter the server name. 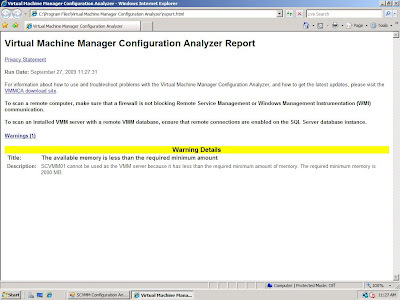 The Analyzer will perform diagnostic and provide a report. 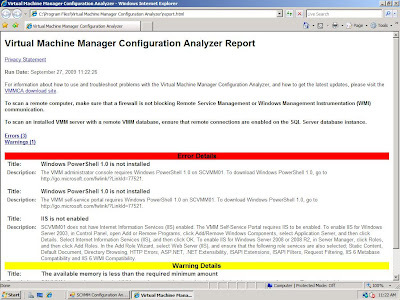 It is recommended to fix all the error (Indicated in red color) before install SCVMM. Re-run the diagnostic once you fix the red error. You can ignore the warning error (Indicated in yellow color about insufficient memory) . Once the diagnostic is complete, you can start the SCVMM installation. 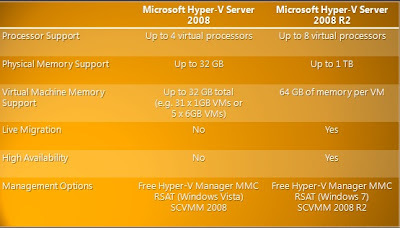 Why Server Core for Microsoft Windows Server 2008 -Hyper V ? 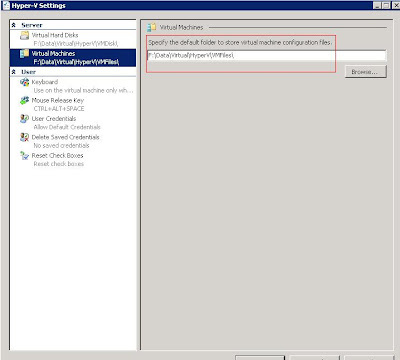 You may wonder how to secure Hyper V. One of the method is using Server Core rather than running on full GUI version. Server Core is like linux and we are back to old days (DOS screeen). After login in, you will only see DOS screen and black screen. Just command line. a) Reduce maintenance. As less component is install, you do not need to perform a lot of patch installation. b) Reduce attack surface. Because fewer application is installed, then less security holes. c) Less disk space required. Server Core require only 10GB compare to full installation of windows Server 2008 which can occupy almost 20GB of your hard disk space. 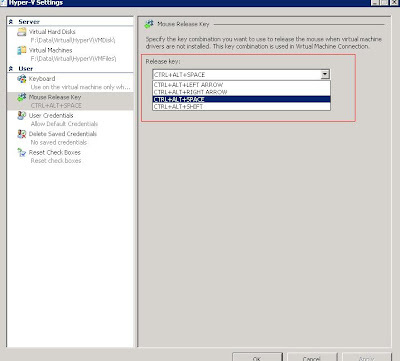 Good thing is after you have performing initial configuration for the server, you can install RSAT tool into your client workstation in order to remotely manage Hyper V.
For those with Technet and MSDN subscription, please proceed to Technet and MSDN website to download the RTM version. A lot of people confused about Virtualization license. Let me explain in more detail to help you understand more so you would not illegally use the Microsoft Licensing. 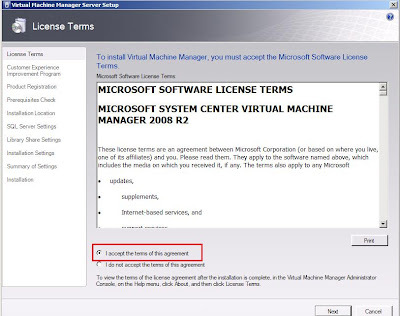 a) VMWARE - you need to buy each Microsoft operating system license for each VM. 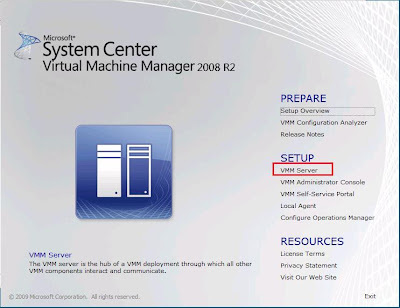 b) Windows Server 2008 Std edition - free running 1 instance of Standard Edition os on the VM. 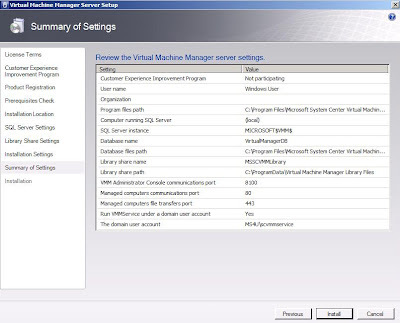 c) Windows Server 2008 Ent edition - free running 4 instance of either Std or Ent Edition os on the VM. e) Microsoft Hyper V - the system is free but you need to buy license for each guest. Similar as VMWARE. There is a term and condition for option b and c.
"The condition is you cannot run any application or roles on the parent partition." 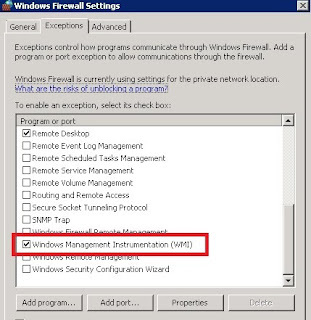 For example: If you install Web services on the Windows Server 2008 Std Edition, you will lose the benefit of running free 1 instance of the VM. 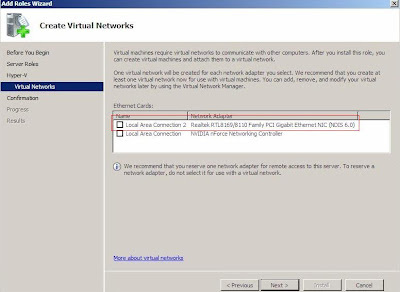 If on Windows Server 2008 Ent edition and you run Web services on top of parent partition, you will lose 1 free instance. That's mean you will only get 3 free instance of VM instead of 4. Anyway as a good practice in virtualization, you should not run any application on the parent partition. Short form called ABE. For those professional level, you must have heard ABE since Windows server 2003. Good news ! ABE has became a built-in in Windows Server 2008. 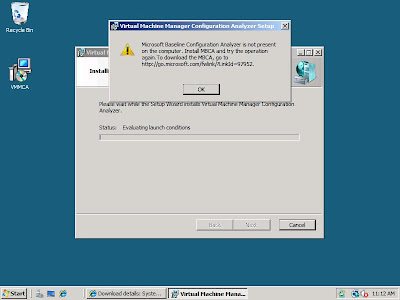 No more downloading ABE as what we are doing for Windows Server 2003. Even thought it is built in, by default this feature is disable. 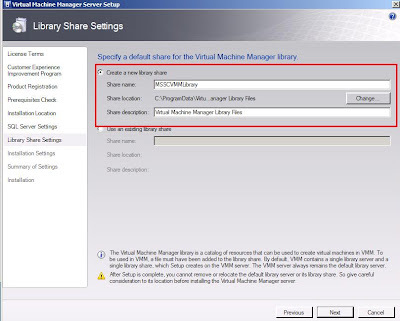 All you need to do is go to Share and Storage Management snap in and enable it. 3. 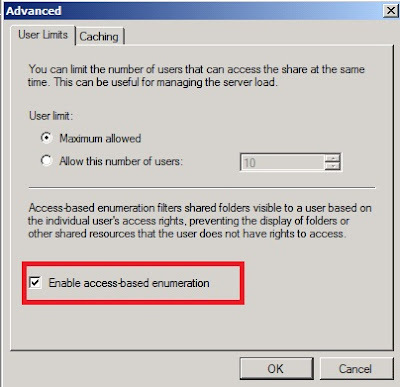 Tick enable access based enumeration. 4. Easy right...let compare the result before and after enable ABE. Before : You will see all folder even thought you do not have the permission. 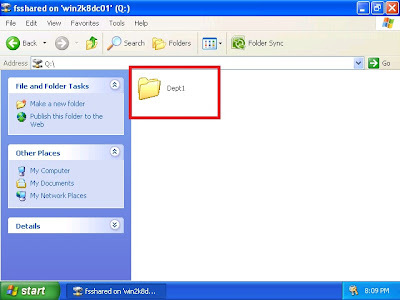 After enabled ABE:- You only see your own folder. It is always a good idea to perform several health check to the existing active directory before doing any potential dangerous domain operation. In this article, i will explain more on the tools that i have frequently used. The last parameter is the schema version number. 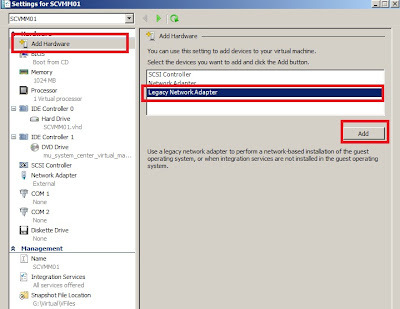 c) Netdiag - domain controller network diagnostic. It helps to isolate networking and connectivity problems by performing a series of tests to determine the state of your network client. 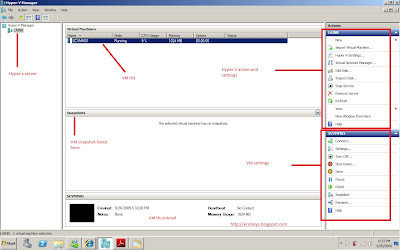 c) dnslint - verify Domain Name System (DNS) records and generate an HTML report. 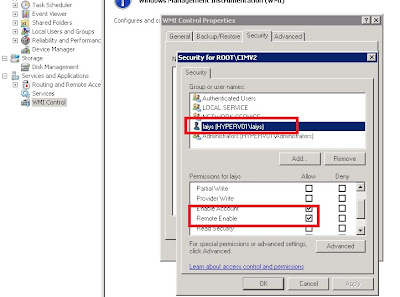 d) repadmin -assists administrators in diagnosing replication problems between Windows domain controllers and used for monitoring the relative health of an Active Directory forest. f) Nslookup - useful tool for dns verification. 'NetDom query /verify' =verify all trust are working and responding to the stored passwords. 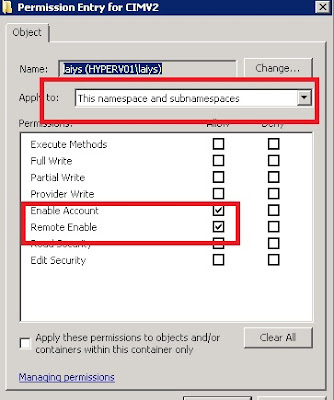 You must review " Hyper V system requirement" first before proceed with the Hyper V installation. 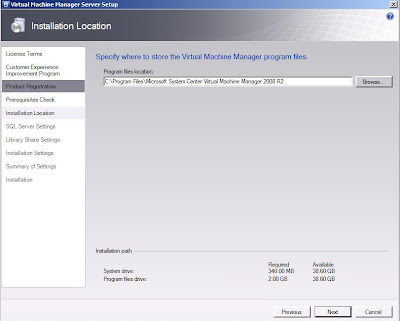 I'm assumed that you've perform a clean installation of Windows Server 2008 64x Edition. 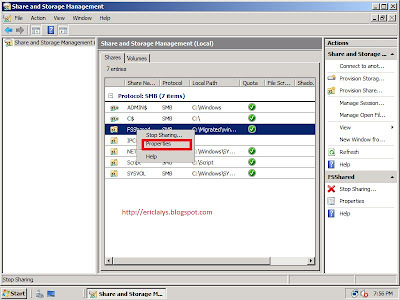 Use Server Manager snap in, right click on the Roles container and then choose Add Roles. The system will now launch Add Roles wizard. Click Next to bypass the wizardâ€™s Welcome screen. 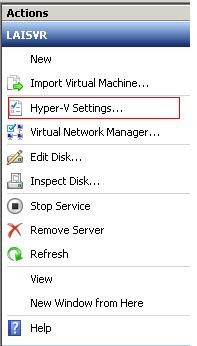 Select Hyper V check box and then click Next. 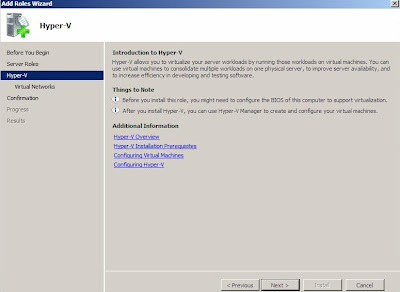 You will see the Introduction to Hyper V which describe about Hyper V. click Next. 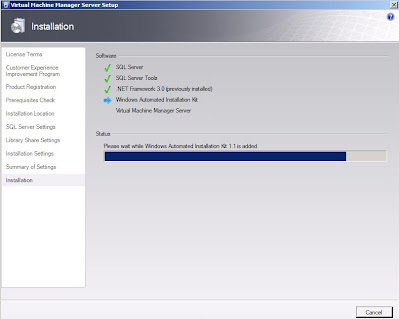 Then you will see a screen confirming the installation of Hyper V. Just click Install. When the installation complete, the system will prompt for server reboot. Just click Yes to reboot the server. When the server reboots, log back into the server and the Server Manager should automatically load and resume the installation process. After about a minute, you should see a message telling you that Hyper-V has installed successfully. Click Close to complete the wizard. Note: For RTM version, you must download and install KB950050. 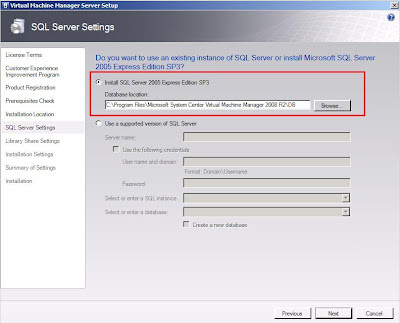 SCE prompt to install WSUS SP2. I 've run the update and this problem occur afterward. a) SCE Update service stop and did not run automatically. If you've manually run the services, the service will stop after a while. 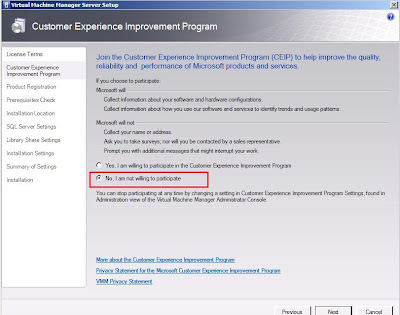 c) Event viewer indicated Event ID 7034:- The update service terminated unexpected. It has done this 4 times. a) Uninstall WSUS SP2 and install WSUS SP1. 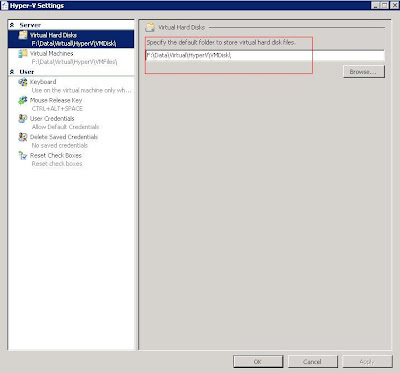 So the best option is "update SCE2007 as a whole product, instead of upgrading a component individually"
Here is a tips which i would like to share when i tried to deploy FCS client in a workgroup environment. a) Copy the Client folder which contain FCS 32x and 64x installation files from the CD into the target computer. 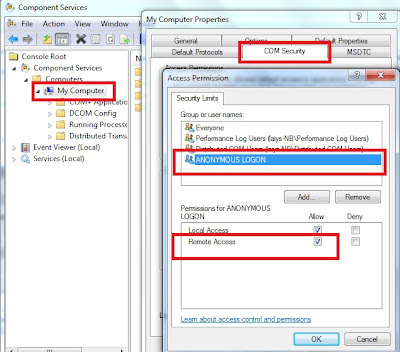 b) Use command prompt, type the command "clientsecurity.exe /nomom"
Note:- If you just execute Step A and B, you will not be able to update the FCS client. c) Go to FCS server and create .reg file called Nonworkgroup.reg using the FCS console and deploy it. 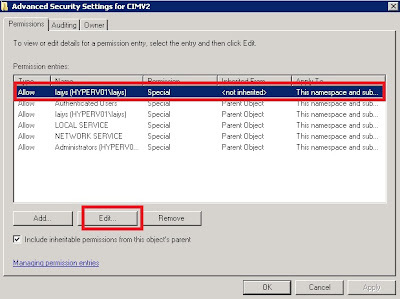 d) Copy the Nonworkgroup.reg file that you have created in step C into Client folder (step A). e) Use the command prompt, type the command "fcslocalpolicytool.exe /i Nonworkgroup.reg" to merge the reg file into the computer. f) Try update the FCS client. It should be working right now. "WUA API 2.0 is installed but the version of wuapi.dll is earlier than 5.8.0.2469"
This is due to older Windows Update agent version installed on your server. Proceed to http://technet.microsoft.com/en-us/library/bb932139.aspx to get the latest Windows Update agent. Once you've install the latest version, you can proceed with FCS installation. I just installed Windows Server 2008 R2 in my laptop. Everything went fine except the wireless card cannot enable. The wireless card will always disable even you had enabled it. I even download several drivers from Dell. But still failed to start it. Finally found the solution to solve this issue. All you need to do is Add-in a feature called " Wireless LAN Service". Sound silly right....but it is working right now ! This is the last wizard for the SCE post configuration. 1. Update Management Configuration wizard allow you to configure proxy setting, configure product update, types of updates, updates languages and synchronization schedule. 2. Select yes and enter your proxy setting. If your environment do not use proxy, select No. 3. Wait for the system to synchronization with Microsoft. 4. Once the system retrieve the catalog, select the product that you want to get the updates. 5. On the language selection, select Yes to select the updates in English locale. To select other language, select No and choose your appropriate languages. 6. On the Clarification, by default the option is download update for critical,security and service pack updates. To select other updates, select No and select your preferred updates. 7. On the synchronization settings, select synchronization to occur daily and Specify the synchronization time. 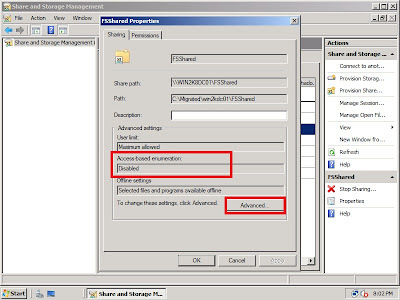 8.Tick synchronization updates when this wizard close to start the synchronization process. That's concluded the SCE post configuration. 1. 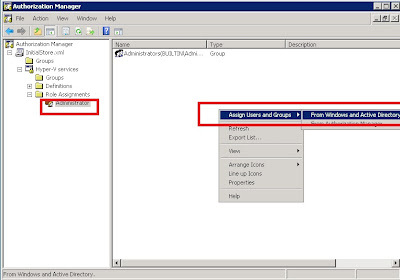 After complete the first wizard, you should select Configure Computer and Device Management Wizrd. This wizard allow you to configure discovery option. 2. Choose Automatic discovery to detect computer in your domain environment. 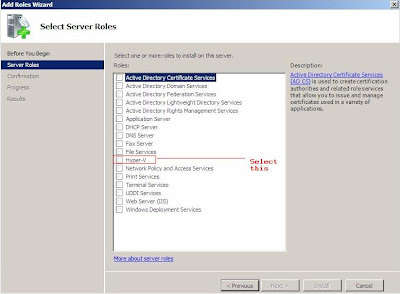 3.On the Administrator account, select Use selected Management Server Action Account. 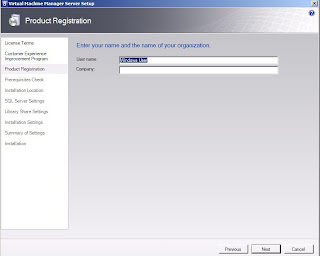 This will use SCEAdmin account that you have created and assign during the SCE installation. 4. Please wait when the system perform system discovery. 5. Once the system discover the computer, it will listed as displayed. Check to select the computer that you want to manage. 6. The system will display the summary of the agent that will be installed in the computer that you select in step 5. 7. The system will display the status of the agent installation. You can wait or close it. It will not interruption the agent installation. That's concluded the 2nd wizard. 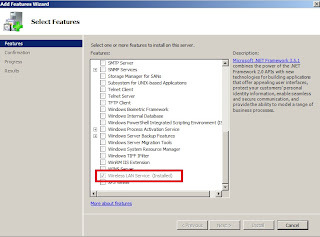 In next upcoming article, i will look into the last wizard which configure the windows update settings.